Pool & Spa Automatic Controls allow you to control the temperature from your pool heater or solar system, turn on and off your pool pumps, pool lighting, filtering, turning valves, control and set run times and many other automated features in your backyard without stepping foot outside. Spaside remotes, both hard wired and wireless can also be added to any pool control system to allow additional control from inside the spa or while your flipping hamburgers on the grill. Most manufactures such as Hayward, Jandy, and Pentair offer pool control systems with a built in sanitizer such as Salt Water Chlorinators. You are then able to purchase just one control panel with the chlorinator built in. This will allow you to have complete control over the pool and spa equipment as well as the chlorine output from inside your own home. The manufactures have also reduced the price compared to buying each system separate. So if you are considering both pool automation and an electronic saltwater chlorine generator you will also save money by purchasing these complete systems. 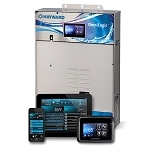 We offer many different types of systems to meet all of you pool automation needs. Feel free to contact one of our automation specialist to discuss planning, operation or technical information about swimming pool automated control systems.